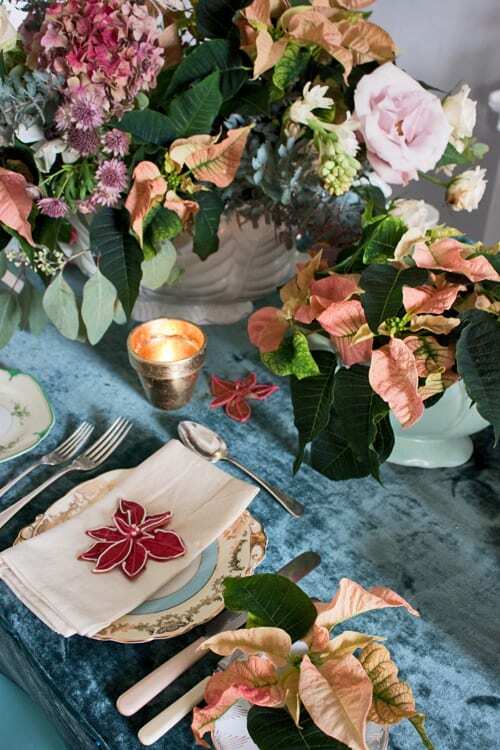 Today’s blog post features the second Poinsettia Christmas table design from the recent International Poinsettia Press Party which I attended. And it’s the turn of florist Rebel Rebel. 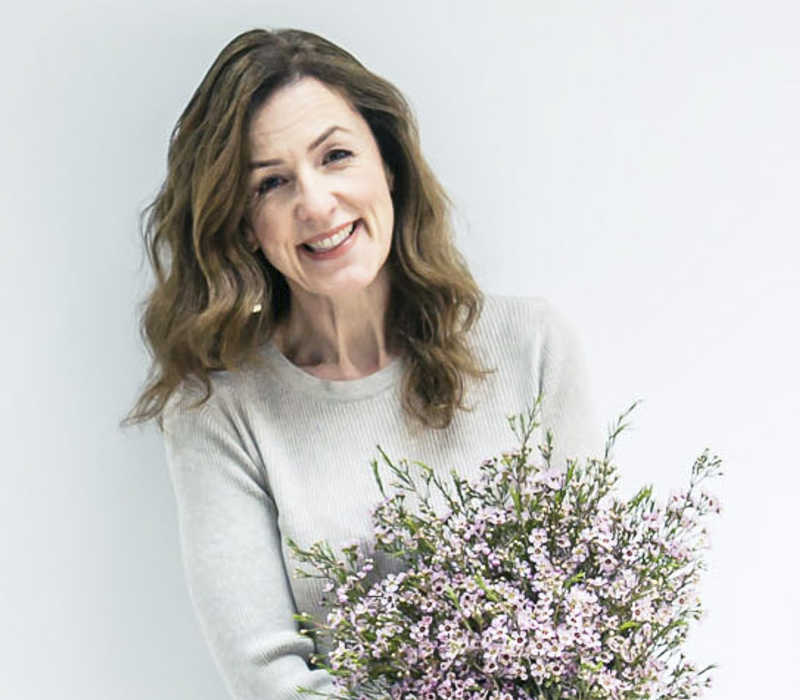 You may remember that I featured an interview with the two founders of the company, Athena Duncan and Mairead Curtin, on Flowerona last year. 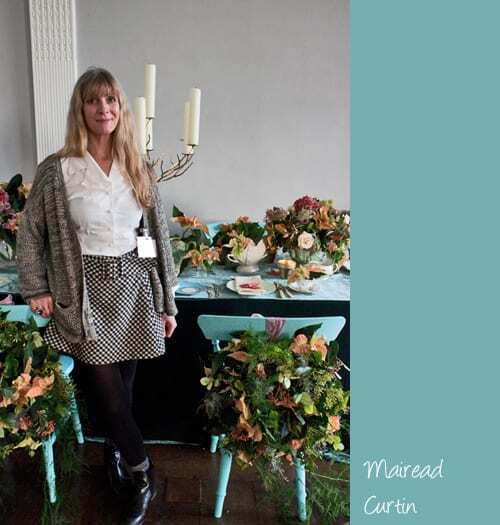 Well, it was such a pleasure to meet Mairead at the party. And I absolutely loved the design which she’d created called ‘Restoration Christmas’! 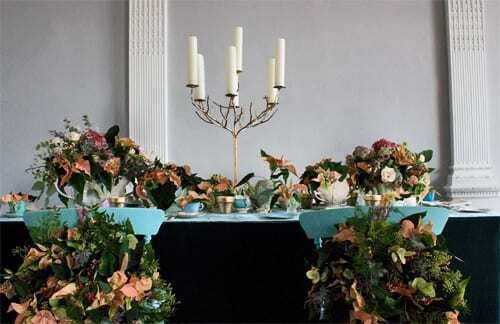 The theme behind the table was the vintage look, using repainted chairs, vintage crockery and showcasing arrangements which had more than a nod to Constance Spry. 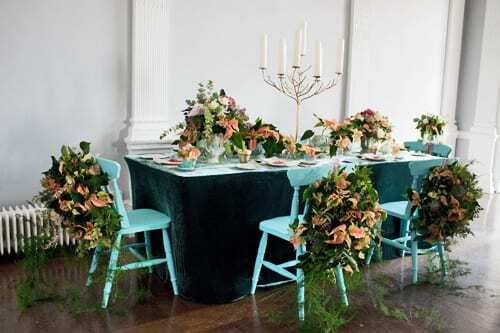 Personally, I thought the vibrant turquoise chairs perfectly complemented the pale peach Poinsettias. 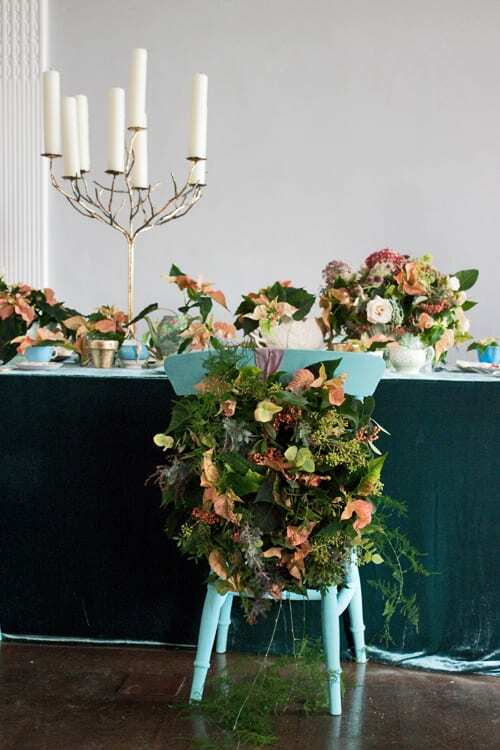 And Mairead had not only used miniature Poinsettia plants, but also the cut flower in the chair backs and table centrepieces. 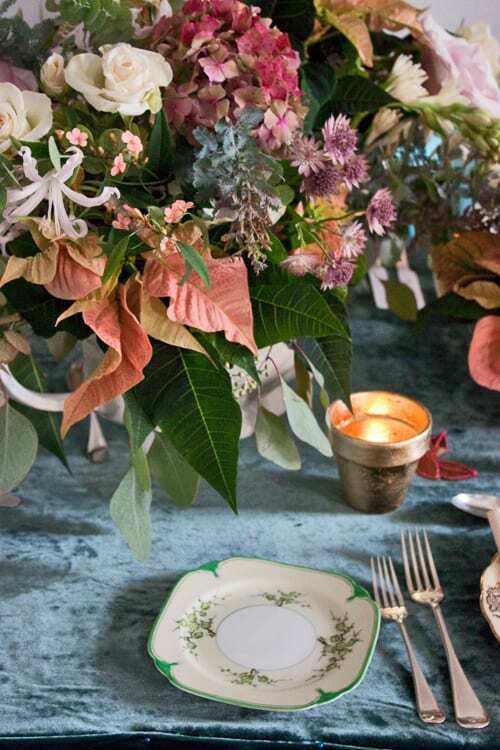 So I hope you’ve enjoyed seeing Rebel Rebel’s stunning Christmas table design and that it’s provided you with some inspiration. Water them carefully with lukewarm water every second day or so. But don’t leave them sitting in water as this will rot their roots. 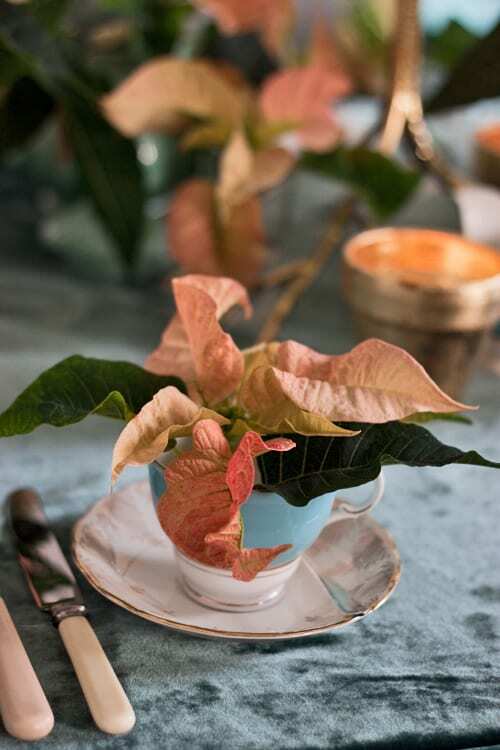 Poinsettias thrive in a light, warm place at around 20 degrees Celsius. And whilst being near a radiator is OK, avoid direct sunlight. If you’d like more information about Poinsettias, simply visit the Stars for Europe website. P.S. 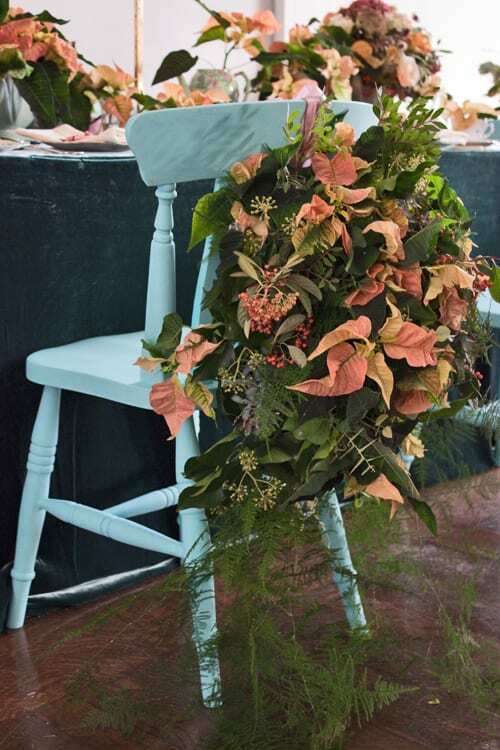 Here’s last week’s Poinsettia Christmas table design created by Paula Pryke, just in case you missed it. Would you like to create your own Christmas Door Wreath? 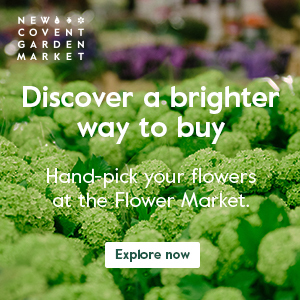 Perfect combination of blooms and colours. It gives you something to smile about even in this dark Autumn season. Absolutely stunning, I love the mix of soft peach, white & pale pinks against the blue. Makes you realise how much you can do with the Poinsettia and not just in traditional red! 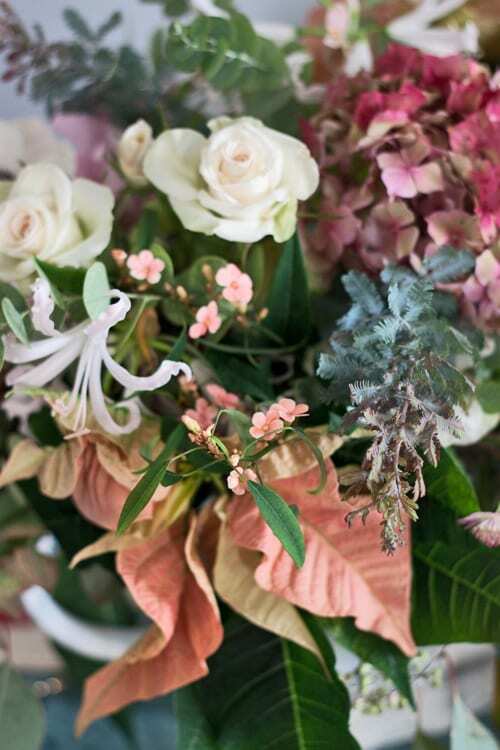 Thank you Joanne…look out over the next three weeks for more beautiful Poinsettia Christmas table designs :-). 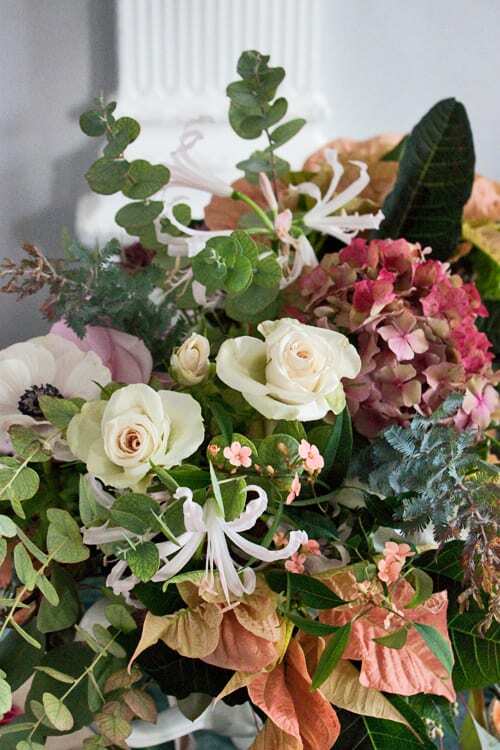 Absolutely perfect combination of colours& textures…Very different- styled wreath with the Fern (?) hanging loose& low- Just beautiful!